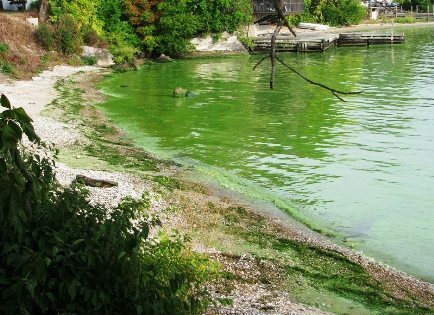 BATAVIA, Ohio (June 14, 2016) – The State of Ohio is now requiring that public water systems that use surface water as a source must test the water on a regular basis for cyanobacteria — harmful algal blooms. The state is coordinating action among the Ohio Environmental Protection Agency, Department of Health, and Department of Natural Resources as it bolsters its response to HABs. In response, the county Water Resources Department is increasing the frequency of its sampling and testing for cyanobacteria at Harsha Lake to weekly, which began June 1. “Weekly samples will be collected and tested and we will test more frequently if any blooms are detected,” said Director Lyle Bloom. Previously, the reporting was voluntary; now it is mandatory. The county’s reports will go to the Ohio EPA. Harmful algal blooms, which often look like blue-green scum atop the water surface, are caused by warm temperatures and an overload of nutrients in bodies of water. They produce a toxin called microcystin, which, even in minuscule amounts, can be harmful to people and animals. Last year, the Ohio River near Cincinnati had an outbreak of HABs. In Clermont County, HABs on Harsha Lake in June 2014 led to public health advisories warning against swimming in the lake. Toledo had to shut down its water intake system after a serious outbreak of HABs on Lake Erie in 2014. The plant’s intake structure, which draws water from the lake, and has three different levels. Algal blooms occur near the surface, so a deeper intake screen can be used to avoid the affected water. A combined coagulation, flocculation, sedimentation, and filtration treatment. In laymen’s terms, this standard treatment removes particles from water. “This method of treatment is extremely effective for removal of algal cells,” said Bloom. Granular Activated Carbon (GAC) treatment technology, which traps contaminants and is a primary way to remove algal toxins. Disinfecting the water at the plant with chlorine, which will inactivate microcystin. One-stop website for beach safety: Ohio’s BeachGuard website (http://publicapps.odh.ohio.gov/BeachGuardPublic/Default.aspx) will now be the single resource for advising the public about recreational water quality. More signs: At state parks, including East Fork and Stonelick, white signs, describing what algal blooms look like, are posted at the beach and boat ramps. An orange warning sign will be added when toxins reach a certain threshold, and a red sign if they reach the danger level. Advisories: Recreational public health advisories will be issued when an algal bloom is confirmed and/or toxin levels meet a particular threshold (for microcystin, 6 parts per billion). An elevated public health advisory will be issued when microcystin levels meet 20 parts per billion. According the Department of Health, health effects of algal bloom exposure can range from a rash, hives, blisters, severe diarrhea, vomiting, and abdominal pain to numbness, dizziness, abnormal liver function, difficulty breathing and death. These symptoms can occur more quickly and severely in dogs and other animals.